The Italian Tito Livio Burattini (see biography of Burattini) was a typical universal genius of the late European Renaissance. 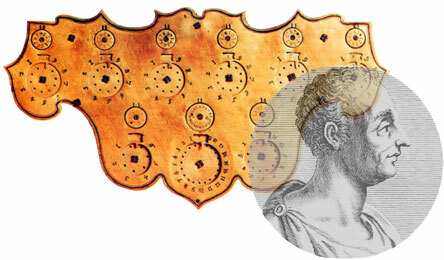 He was a skilled architect, astronomer, mathematician, optician, mechanic, etc. Ferdinando II was obsessed with new technology, and had several hygrometers, barometers, thermometers, and telescopes installed in his palace. Burattini apparently knew him very well because he served the Polish court and in 1655-1657 he took part in several diplomatic missions in Austria (Vienna) and Italy (Florence, Bologna), spending some time as a guest of the Grand Duke. It is known also that while in Florence, Burattini had designed a water clock for the Grand Duke and later made several microscope and telescope lenses for Ferdinando II's brother, Cardinal Leopoldo de' Medici. The Grand Duke obviously highly appreciated Burattini, because in August 1657, returning from his mission in Florence, Burattini brought with him in Poland many gifts of the Grand Duke, "quelques gentilesses de mécanique". As it was mentioned in the article for Pascaline of Blaise Pascal, around 1650 Pascal donated copies of his machine to Queen Christina of Sweden and to Maria-Luisa Gonzaga, Queen of Poland. While in the Polish court in Krakow, Burattini had the opportunity to observe the work of the Pascaline donated to his patron, the Queen. Thus in the 1650s he decided to build a similar device (like Pascal's contrivance) himself. Presently the machine, attributed to Burattini (see the photo below) is kept in Florence, Italy, in the Istituto e Museo di Storia della Scienza. The device (complete with a wooden case) consists of a thin sheet of brass with length of 20 cm, upon which surface are mounted 18 disks. All the disks are connected 2 by 2, which means, that every upper (bigger) disk is connected to the lower (smaller) disk. By that means, carrying of numbers can be done only from an upper (bigger) disk to the lower (smaller) one, but not between different digital positions of a number. Recently a new version (and it seems rather well-grounded) for the above-mentioned device, attributed to Burattini, was proposed by the historian Vanessa Ratcliff. Exploring Samuel Morland and Morland's calculating machines, she not only noticed the well-known fact, that Burattini's machine is quite similar to one of the devices of Morland, but also examined at some length the inventory information for the Burattini's machine to make the conclusion, that the present machine was not the original one of Burattini. So it seems an entirely different machine, not only by appearance, but also by dimensions (21 cm long, with 18 wheels, while the first machine was 43 cm long and had 8 wheels.) Interestingly enough, the new description fits perfectly with the present object from the Florence Museum, but not with the description of the original machine of Burattini. So what happened? So it seems the present machine is a later device (very similar to the money adder of Morland), made by an unknown maker and mistakenly attributed to Burattini, while the original machine of Burattini unfortunately had been lost. 1) Ratcliff, J. R., "Samuel Morland and his Calculating Machines c.1666: the Early Career of a Courtier–Inventor in Restoration London". Brit. J. Hist. Science, 40(2), 2007, pp. 159–179. 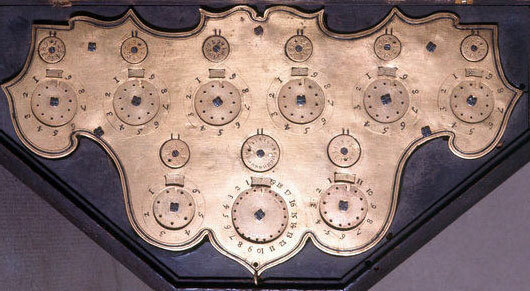 2) Hénin S., Early Italian Computing Machines and their Inventors, in: A. Tatnall (ed. ), Reflections on the History of Computing, Springer, 2012, pp. 204-230.